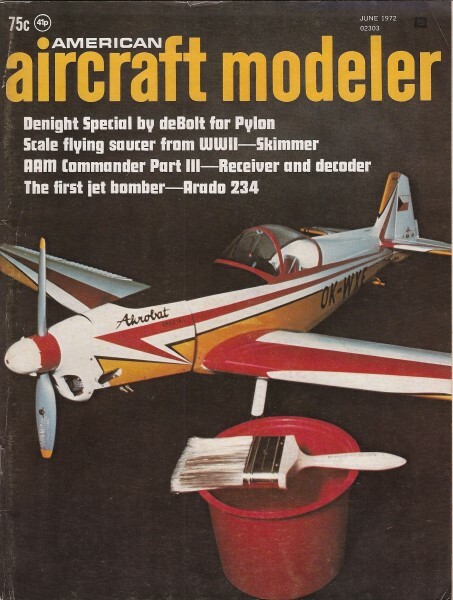 Airplanes and Rockets visitor Steven S., of wrote to ask that I scan the article for the Quarter Pint and So-Long free flight models that appeared in the April 1972 American Aircraft Modeler. 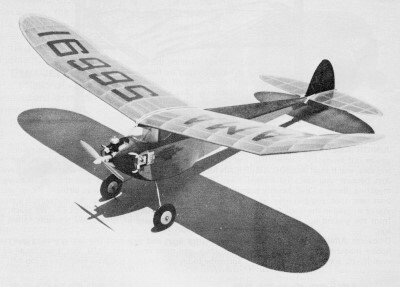 The So-Long, a basic free flight nitro model, gets its name (partly) from using a 1/4A engine (Cox .020). Per Steven's letter: "As a teenager I bought many issues of AAM. I built 'Quarter Pint' from the April 1972 issue and 'So-Long' from the June 1972 issue. Every so often I try and find any info on the magazine or plans so I could build them again nearly 42 years later. What a treat to find your website and see the covers of those magazines. I remember them like it was yesterday. I want to build these two planes again. 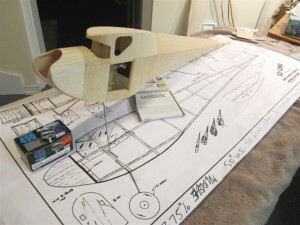 I remember in high school enlarging the planes using an overhead projector for Quarter Pint, I couldn't wait to order the plans but did order the planes for So Long. Of course I had the tank full and seemed the engine ran forever. I still have the engine from from QP after all these years but So Long lived up to its name and flew away never to be seen again on its first flight." See Steven's Bee-Tween, Ace Whizard, Simple Citabria, Simple Duster, Quarter Pint, So-Long, and Ace Pacer models. An .020-powered mini-old-timer. Flies great and has a definite personality. Original dates back to 1940. From out of the past came the thundering hoof beats of the great horse Silver and the hearty cry "Hi-yo Silver, awaaay." The Lone Ranger rides again. If you remember that coming out of your radio (that's right, no picture tube), then you just might remember Bill Englehardt's 1940 Class B Nationals winner, So-Long. With a screaming Ohlsson 23 up front it made three consecutive 005 flights and was the class of the field. Its descendant, presented here in miniature, has proven to be a worthy successor even if it did take thirty years to make the scene. In three contests to date it has two first places and one second place to its credit. One of those first places was at the Old-Timer Championships in June 1970 where it put in three consecutive five minute maxes and a six minute fourth flight for a four flight total of 21 minutes. It may not chase the FAI ships off the field, but it "ain't" bad for a country boy. I can't recall how the scaled down old-timers got their start, but happily they did and they afford a lot of fun. Their cost is low and there's no need to go hunting around for old ignition engines, coils, condensers, etc. in order to put an old-timer in the air. It has been a pleasant development to see the younger modelers take a liking to these little ships. It demonstrates their wide appeal, and practically speaking, it provides strong young shoulders to help us ancients (30s, 40s, and 50s don't ya know) get started across the field when the thermals blow in. So much for background, clear off the table and let's get started sticking this thing together. Look into your scrap box for items not listed above and you'll probably find them. 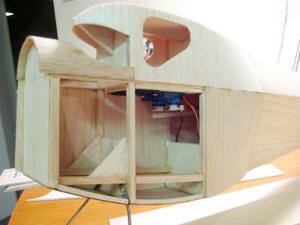 The fuselage is the only area where you have to read the instructions quite carefully. Once completed, the fuselage is very rugged, but until it is fully sheeted, care must be exercised to in­sure proper alignment. Note that the firewall has down thrust built in to it - this is important, as is the zero-zero alignment of the wing and stab mounts. 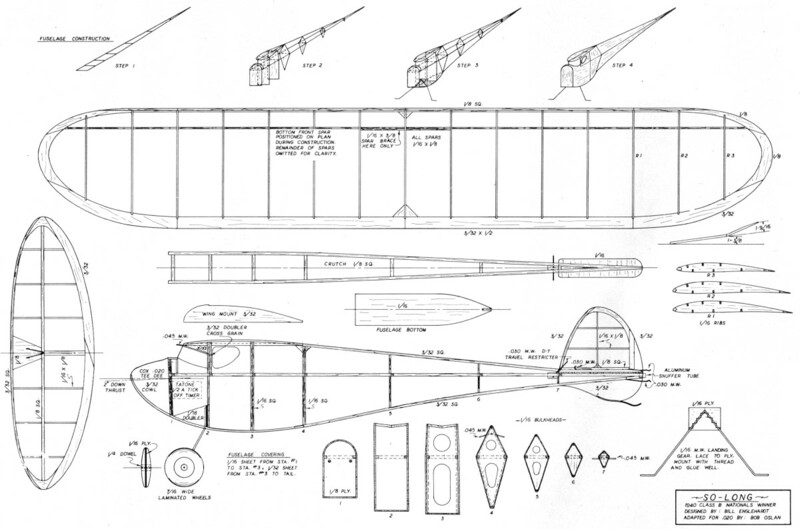 The plan shows the fuselage construction sequence. It is designed to minimize alignment problems. The following description plus the illustrations and some patience should make the task a pleasant one. 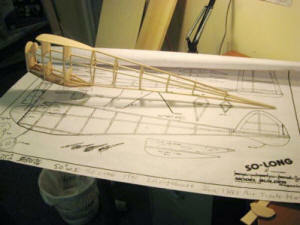 Build the crutch using hard balsa for the longerons. Glue the bulkheads (don't forget the lightening holes) to the crutch. 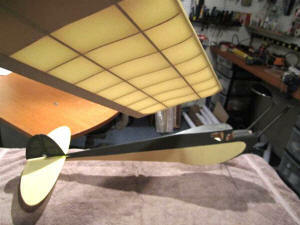 Glue the wing mount in place, and then add the top longeron. Eyeball everything carefully to make sure nothing is twisted. 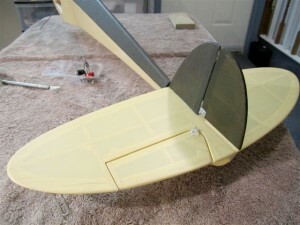 Pre-bend the 1/16 sheet fuselage bottom before attaching it to the bulkheads. This is important if alignment is to be maintained. There are two I methods to accomplish the pre-shaping. One is the time-honored tea kettle and its finger-cooking steam method - very effective, but sometimes painful. Another method, which should appeal to the more scientific-minded practitioner of our hobby, is to soak the wood for 30 min. in household ammonia. After this treatment the wood becomes very pliable and sets permanently whichever way you bend it. (A gas mask is quite useful in this technique, but if you can hold your breath for a long time you'll be alright.) With the bottom sheet properly shaped and the bottom longeron glued to it, carefully glue the assembly to the bottoms of the bulkheads. Here again, eyeball the alignment so that twists are kept out. 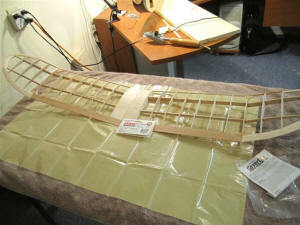 When dry, install the landing gear, gussets, doublers, wing and tail wire hooks, etc. Begin sheeting at the front and work back to the tail. Refer to the plan for grain direction. 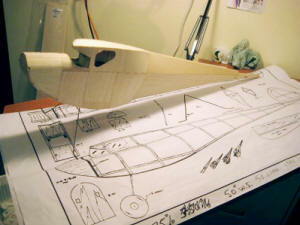 The last pieces to go on are the bottom-rear of the fuselage. 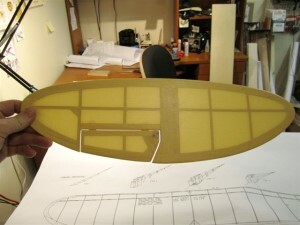 Note that bulkheads 3 and 4 have 1/16 square strips glued even with their outlines. This is to provide more glue surface at sheet joints. 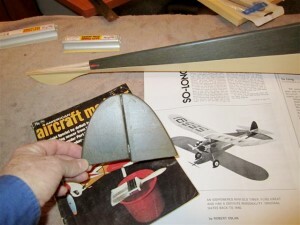 Attach the subrudder and begin with the sandpaper-a neat job will payoff in weight saving and flight time. Make sure you didn't forget to put the blind nuts in the firewall for the engine screws. 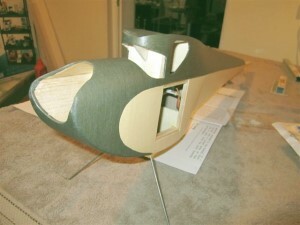 For the wheels cut lightening holes in the 1/16 plywood core. 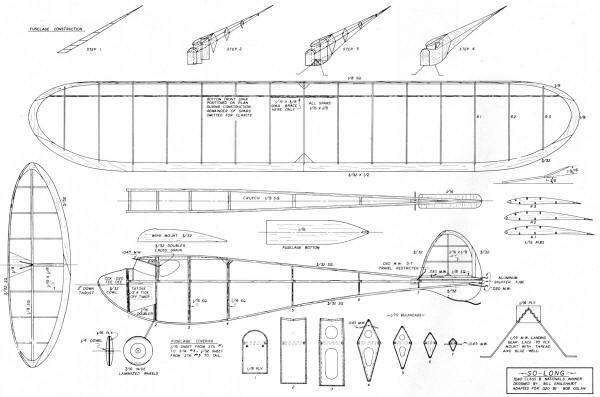 The instructions for the building of the empennage on the plan are self-explanatory, and you will find that the leading edges of both the rudder and stab require one of the pre-bending treatments mentioned before. Multi-spar wings are pretty much the order of the day. The plan shows only the bottom forward spar because it is positioned on the plan during construction, as this helps to keep the ribs in proper alignment. It should be rein-forced with the 1/16 x 3/8 spar brace at the center section as it and the trailing edge are the only things that make contact with the wing platform. The brace keeps the spar from being crushed. Spar connections at dihedral breaks are left to individual taste. I prefer overlapped spar joints for ease of construction and strength. The entire model is covered with Jap tissue and gets four coats of thinned dope (60/40). It is advisable to use a plasticizer in the dope to prevent or at least reduce warps. The windshield and bay windows are installed after the ship is covered. Finished weight should be 4-1/2 to 5 oz. The ship should balance at 50 percent of the wing chord. If alignment has been kept true and there are no warps, then a hand glide will be straight and flat. First power flight should be with the prop on backwards and the engine running rich. Increase power very slowly as test flights proceed. The power pattern and glide are both to the left. Because of this left/left pattern you'll have to be careful in the beginning not to wind in under power. I've built two of these mini-So-Longs and they have flown identically with identical adjustments. In each case I've used a wedge tab under the left wing to keep the tip from dropping too much under power. Once you locate its groove, the ship is extremely stable. Under full power, it should spiral up and not hang on its prop. A straight-up climb will kill altitude and foul up the power/glide transition. When fully trimmed, put it on its wheels and try an unassisted takeoff-it really charges into the air. Don't forget to light the fuse. 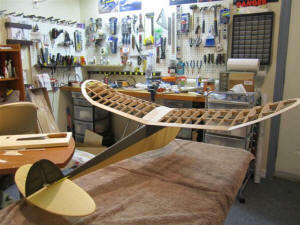 So-Long wing ready for covering. Note slight undercamber in ribs - that'll be fun to cover! "A few more pics of "So- Long", this is the 50" full size version. 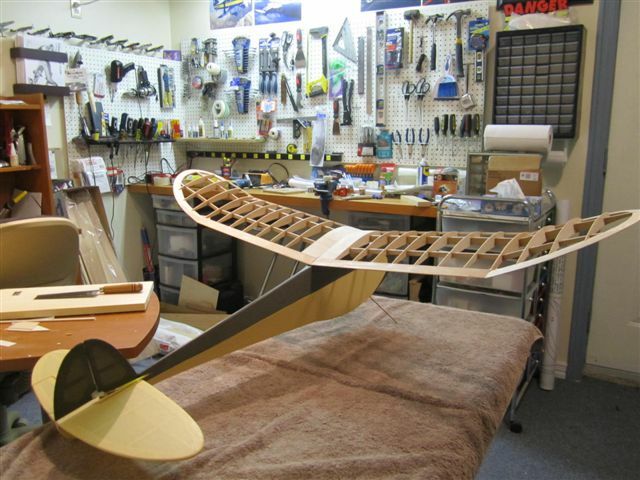 Very difficult and time consuming fuselage to build and keep straight. Will be 3 channel e-power. Have a door on the side for battery access." "Here is a couple of pics of "So Long", so far. 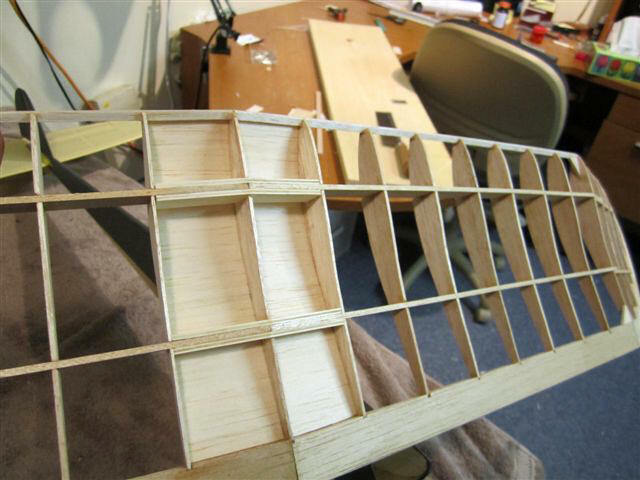 The fuselage is much harder to build and keep straight than a rectangular one, quite elegant though as it transitions from rectangular to triangular. It gets fully sheeted so starting on that tonight. I won a bid on a Cox .020 for QP and thanks for the eBay tip for AAM magazine. I won a bid on lot of those several 71-72 issues. It includes the one with the 020 smaller version of So-Long but I still need to find the April '72 issue. Lots of fun. It's so refreshing to build something from plans again that doesn't cost mega dollars, instead of just putting expensive equipment in Chinese ARF's. Thanks, Steve"